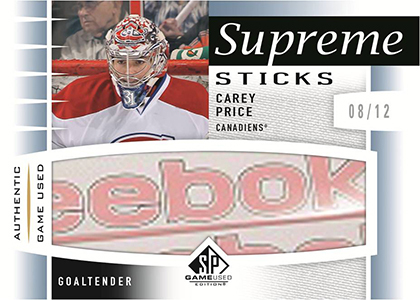 2013-14 SP Game Used Hockey lives up to its name by offering plenty of memorabilia. But what sets it apart from a lot of other releases is that there's a focus on pieces from important games. Similar to last year, every pack promises either an autograph or relic card. Five-pack boxes have at least one signed card. 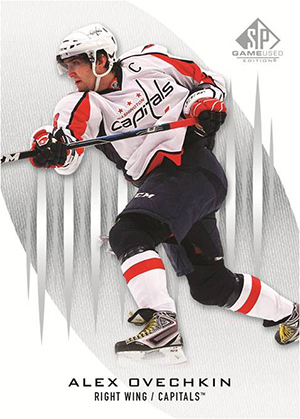 The 2013-14 SP Game Used Hockey base set has 100 cards. In addition, there are Authentic Rookies short prints that are numbered to the player's jersey number. This makes for some extremely tough rookie cards. For example, Nathan MacKinnon has just 29 rookies in the release. 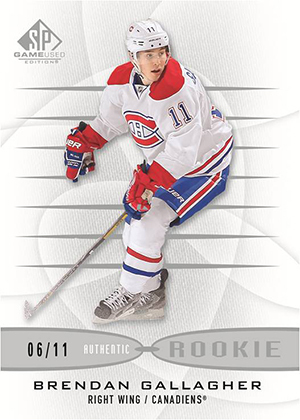 Adding a little spice, the final rookie card for each player comes with an autograph (ie 29/29 for MacKinnon). Base cards and rookies have Gold Autograph parallels. Base versions are inserted 1:40 packs while Gold Autograph Rookies land approximately 1:10 packs. 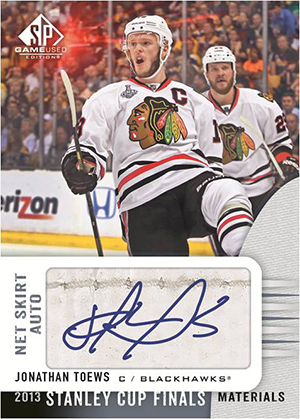 Inserted 1:3 packs, Authentic Fabrics are the most common memorabilia cards in the product. Besides basic versions, there are several levels of multi-swatch and patch parallels. These deliver as many as eight memorabilia pieces. 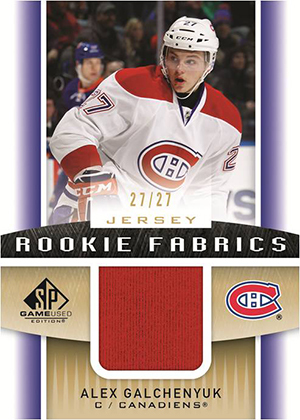 2013-14 SP Game Used Hockey includes memorabilia from both the 2013 Stanley Cup Finals and the 2012 Heritage Classic. 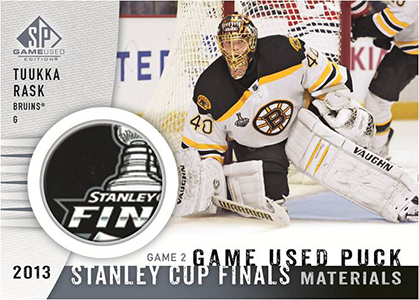 Stanley Cup cards come with pieces of game-used pucks and net cord. Net skirts are used as an autograph canvas for select players. There are also one-of-one net skirt patches. Heritage Classic cards focus largely on pieces of game-used nets and one-of-one net shields. Collectors can hunt for other pieces of premium memorabilia. Supreme returns with jumbo pieces of equipment. Supreme Patches, Supreme Sticks, Supreme Gloves and Supreme Skates are all numbered to 12 copies. Tandem Twigs (1:90 packs) come with stick pieces from two superstars. Game Gear (#/3) squeezes a jersey, patch, fight strap and tag patch onto a single card. Besides autographed parallels, 2013-14 SP Game Used Hockey has several other signature sets. Draft Day Marks return with rookies numbered to 35 and veterans numbered to 10. Other autographs include Inked Rookie Sweaters (#/99), Inked Sweaters (#/10 or less) and SIGnificant Numbers that are limited to the player's jersey number. Serial numbered to jersey number. Card #AF2-BL only has a patch parallel. seems like a good box for people who collect hits. but there are very few cards. when is the release date? and how much would a case be? and an individual box? Ethan Tsin � Pricing isn’t out yet. It’s likely in the ballpark as last year’s. It’s scheduled to be out in January. A sure buy, my favorite UD product. Hope to have better base card this year than last year (flaws), or put OPC base card in. I opened a box last weekend. to start I got Austin Watson Auto, and Mckinnon, and Yakupov rookie fabrics, another jersey nothing to remember and a Morgan Reilly 44/44 authentic rookie with auto. And a blank pack!! The Reilly card is of course great but does that deserve a blank pack?? If you agree no please let me know who you think I should contact about this.. Also it will be on ebay soon! Bought 2 packs (expensive product). First pack yielded a common double jersey card. Second? 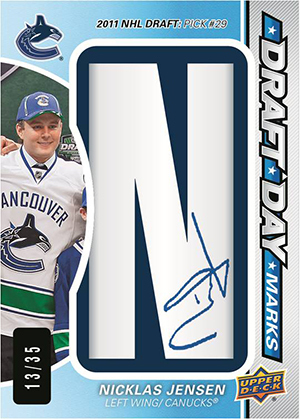 Very impressed with the Morgan Rielly draft day marks card. Love the on “I” autograph (I think stickers look cheap). Aesthetically pleasing (even though I hate the Leafs), looks amazing in any collection. Would recommend and definitely buy again! This is the set that got me started in hockey cards – due to the chase for the net cord cards. After going through a few boxes, I did pull a Bergeron net cord!!! Also, the rookie autos and authentic fabrics are great cards. Base cards look nice too. Highly recommend.